Terror On Rural Street Haunted House was started in 1998 by Hartford Community Service Inc, a 501c3 Non-Profit Organization, with the sole purpose of raising money for the community by scaring the Sh*t out of people. What the organizers didn’t plan on was that their efforts would draw the attention of actual spirits that haunt the old Libby’s Canning Factory that Terror on Rural Street calls home. 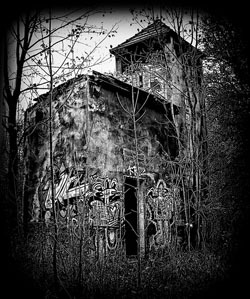 It wasn’t long after construction started on the new haunted attraction that strange and unusual events started to befall the workers. It is not uncommon to be walking down the halls of the building and hear footsteps following behind you only to turn around and no one be there. The best known spirit is that of a little girl that was killed in an accident when the canning factory was still active. She has been seen peeking around corners and heard humming a tune. Some workers have claimed to smell candy when she is nearby. So if you’re brave of heart come down to Terror on Rural Street Haunted House and see if you can survive the creatures we create and the spirits that remain. No Alcohol,Open Drinks, Smoking or Open Flame inside Event. No Flashlights, Glow sticks, Laser Pointers or Cell Phones. DO NOT touch the creatures or handle the props. The creatures will NOT touch you. Intense Lighting and sound, Fog, Tight and Dark Places, Uneven floors, areas that (may) require you to bend down low. If you are sensitive to any of these elements, Please consider before entering. prosecuted under local and state law. Notice: Your picture may be taken during the house and posted on our Facebook or Website. accompanied by an adult.. Use your own discretion if you choose to allow your children to enter.